Photos of the "nonexistent" Groom Lake security force, from public sources. If you think you can identify these guys, let us know. They could be among the List of Cammo Dudes on the main page. NEW! Reader insane@aztec.asu.edu has provide this photo of a Cammo Dude flipping him off (37k, added 6/12/97). 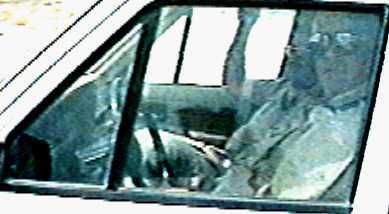 He says the photo was taken Sept. 1, 1996 near the border signs on Groom Road. This photo is a frame grab from a news story aired by ABC World News Tonight on 4/19/94. 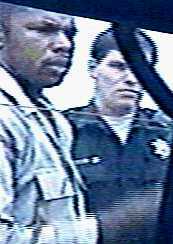 The video was shot on 4/8/94 on an unmaintained road near Freedom Ridge, on public land about 2 miles from the military border. 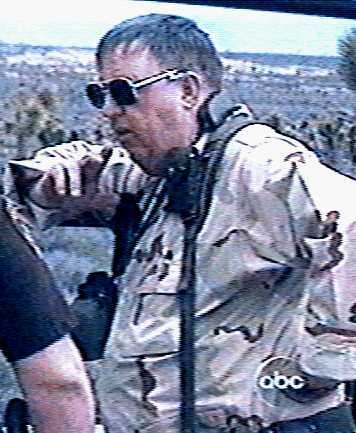 These videos were taken during the encounter in which all of ABC's video equipment and tapes were seized. Reported in DR#7 | update in DR#8 | Transcript of Report. The arm in lower left corner is that of Sargeant Douglas Lamoreaux of the Lincoln County Sheriff's Department. From ABC video taken at same time as Chubby Dude. On the right is Lincoln County Deputy Kelly Bryant. Like Bryant, this Dude was playing second fiddle, while Lamoreaux and Chubby did most of the talking. This photo is a frame grab from a news story aired by ARD, a German TV network, on 7/4/94. 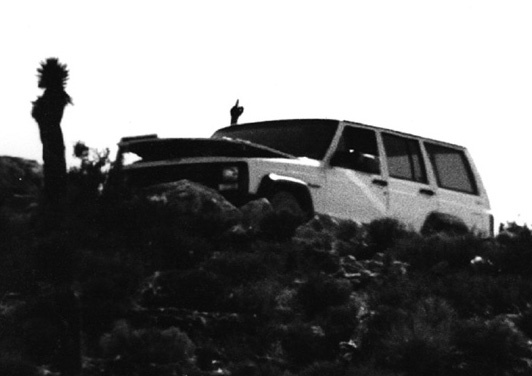 The video was shot on 7/1/94 on the Groom Lake Road, on public land about 3 miles from the military border. These Cammo Dudes were sitting in their white Jeep Cherokee beside the road. I advised the crew to jump out fast and try to interview them. True to form, the Dudes immediately sped away, but the cameraman got a got a good shot of them as they drove past. The guy in the driver's seat looked real mean and could have been provided by Central Casting. Hence we call him "Mean Dude." See also "Wimpy Dude" in DR#30. Photo of two dudes taken near the border by G.C. Groom Lake Security Manual. Document proported to be security procedure manual for Area 51. Cammo Dude Roster. Article in Groom Lake Desert Rat #35. List of Cammo Dudes deputized by Lincoln County Sheriff's Dept.